Annual Gala, “Jazz at the J” with Featuring Bob Sneider Quartet with Special Guest John Nugent (Other acts include Katie Ernst, Latin Jazz with Tony Padilla, Paul Smoker and the Nazareth Faculty Jazz Group, and Loose Change (Nazareth College Jazz Combo) @ Jewish Community Center, February 12, 7:30pm. We've compiled these listings from information obtained from the performing artists themselves and other sources. 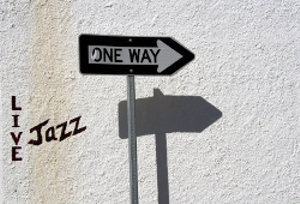 The aim is to give you a one stop place to find all your jazz in Rochester.The aim is to give you a one stop place to find all your jazz in Rochester. Only start times are listed, visit or call the venue for more details (the sites for many are in the right panel). Please forgive me for any discrepancies with reality and feel free to let me know what the problem is, and I'll get the corrections up on the site as soon as possible (click on the "Send an email to Jazz@Rochester" link). If you go out to hear a performance listed here, feel free to drop a comment to this post about how it went. I want to hear from you! You see a pattern? Yes, this is Rochester...it's January... I should not be surprised should I? But I'm feeling it in my bones (literally, my old knees and their scar tissue are just about fed up with it). There's a bit of jazz being played here and there around Rochester. Here's what I was able to find out (tell me if you know of more...). Producers John Nugent and Marc Iacona today announced five headliners for the 10th Edition of the Xerox Rochester International Jazz Festival to be held June 10-18, 2011. Grammy Award winner Natalie Cole will perform on opening night, Friday June 10. The Fab Faux (a Beatles tribute band) plays Saturday June 11. Bela Fleck & The Original Fleckstones performs Tuesday June 14.
k.d. lang takes the stage on Thursday June 16. All performances will be at 8 p.m. at Kodak Hall at Eastman Theatre. Tickets for headliners go on sale Friday January 21 at 10 a.m. Prices range from $35 to $125 plus Ticketmaster service charges (online service charges will vary. Only $1 service charge at The RBTL Box Office at The Auditorium Theatre, East Main St). Tickets may be purchased at the website, Ticketmaster.com, charge by phone at 800-745-3000 and all Ticketmaster locations and in person at the Auditorium Theater Box Office, 885 East Main Street Rochester, NY 14605. Writing this post after shoveling out our driveway (and digging my car out on Park Ave.) for nearly two hours is painful, but it is a labor of love. The Tamir Hendelman concert on Sunday, part of the Exodus to Jazz series was great! I leave you with an image (compliments of jazz image maker John Herr) from that gathering at the ETJ's new venue, the Reformation Lutheran Church on Chestnut (hence the pulpit in the background...). So here are the listings for the next seven days. Enjoy! Now where did I put ibuprofen....? RIT Performing Artists Concert Series presents Transmogrification (with ESM Faculty Member Dariusz Terefenko transforming the music of Chopin into jazz) @ Ingle Auditorium, RIT, Student Alumni Union, 8:00 pm (Ron Netsky's profile here). Great sounds and good turnout here in the Reformation Lutheran Church for Tamir Hendelman Trio. Jazz Around Town: So did all the snow come in December .... I doubt it! About to go into the studio to record, Aaron Staebell and B&B kick it out on "No One Reads Your Blog...!" (Aaron, hope you mean some other blog ...). ETJ makes Rochester one of Tamir Hendelman Trio's "Destinations"
[T]he attention shifted from the diva to her pianist. In a brief solo toward the end of "Some Other Time" Tamir Hendelman played a run so complicated and so beautiful that Streisand turned to the audience and, with her hands and the look on her face, asked: is this guy ridiculous or what? Hendelman is typical of the caliber of artist that Exodus to Jazz brings to Rochester. While he is not a household word, in jazz circles he is known as one of the best (just ask Tom Hampson, who on his radio program "Mostly Jazz" on WXXI played a number of cuts and nearly gushed in his adoration of Mr. Hendelman's playing....). A member of the acclaimed Jeff Hamilton Trio and Clayton-Hamilton Jazz Orchestra (both for over 10 years), Hendelman has also recorded with Streisand, Diana Krall, Gladys Knight and John Pizzarelli. He is the pianist/arranger on Jackie Ryan's You and the Night and the Music and Janis Mann's A Perfect Time. He is featured on Natalie Cole’s Grammy-winning CD Still Unforgettable and Barbara Streisand’s CDs Love Is The Answer and One Night Only. Tamir’s 2008 debut CD Playground and last year's Destinations have both been critically acclaimed and reached #3 and #2 on the US Jazzweek charts. Hendelman will be coming to Rochester with German bassist Martin Wind and Tim Horner on drums. There are videos of Tamir Hendelman swinging with a trio last summer in California here and talking about making Destinations here. This will be the first concert of the Winter/Spring season for Rochester's Exodus To Jazz series (more concerts in the series can be found on ETJ's site here and the first in ETJ's new venue the Reformation Lutheran Church on 111 Chestnut St. in Downtown Rochester, a venue that many love for the great sounds you've heard there during the Nordic Jazz Now series featured there during recent Rochester International Jazz Festivals. Tamir Hendelman will be here on Sunday, January 9, 2011. The concert starts at 6:00 pm. Doors open at 4:00 to accommodate the pre-concert buffet for reserved ticket holders that begins at 5:00 pm. There will be two one-hour sets. Reserved Table tickets are for seats at small rounds seating 4 to 5 people; price includes pre-concert buffet beginning at 5:00PM. Reserved Theater tickets are for preferred seats in reserved section available on a "first come, first seated" basis. They are on sale at all Wegmans stores and online at BrownPaperTickets.com. You can get more information from the new Exodus to Jazz website and blog. Full Disclosure: Jazz@Rochester is now a sponsor Exodus to Jazz and I've been helping Jose DaCosta, ETJ's main man and a friend. Why? The main reason is that while there are a number of great musicians playing jazz in Rochester almost any night of the week, Jose is with ETJ one of the few trying to bring top flight jazz artists from elsewhere into town to share their music live with us. If there is anything that Jazz@Rochester is about, it's supporting live jazz in Rochester. Live is the best way to hear this music. Each concert or club appearance is a unique musical experience&emdash;it will only happen on that one night. I hope you come out and join us for the one that will happen next Sunday!